Aluminum siding on the exterior of your home adds a durable protective layer to your home. 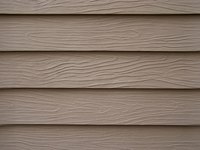 Siding also reduces maintenance by providing a wide range of colors that can last for many years. Aluminum siding can be removed and replaced during home maintenance. Storms or hail can dent or damage aluminum siding, calling for repair. Removing good siding can reduce the chance of damaging it when doing other repairs. Inspect the siding for loose sections. A loose siding section may be the easiest to remove. If none are loose, then start at the top section. Pull out the bottom locking edge of the siding from the section below it with a siding removal tool. This will expose the nails holding the section below the one you have loosened. Do not bend the siding upward. If you bend it the siding may develop creases that cannot be removed. Remove the nails that are visible for the siding section using a nail pry bar and pliers. Do not press down on the siding while removing nails; you can bend or crease the siding. Remove the loosened section of siding by sliding it down. Mark the back of the siding with a number or designation of your choosing, and make a note or diagram with the part numbers. This will permit you to re-install all the siding in the same location. Remove each siding section below the one you have removed. Remove the siding section above an adjacent section where the seams overlap. You can bend the siding by trying to remove underlying sections first. Inspect and clean all the siding you have removed. Buy new aluminum siding nails; do not re-use old ones. Inspect the trim, flashing and edging where the siding was installed on corners and around windows or doors. Replace any damaged flashing or trim as needed. Reinstall the siding by starting at the bottom course or section. Replace the siding section in the same location by referring to your diagram. Do not nail the siding too tightly; the siding nails should allow slight movement of the siding for expansion and contraction due to temperature changes. Do not pry aluminum siding away from the house by pulling on the seam where two sections overlap. This will bend the siding and make it unusable for replacement. Aluminum siding edges and corners can be sharp. Wear leather or cut-resistant gloves whenever you handle aluminum siding.